I’ve never been a “go out on New Year’s Eve” kind of person. I’d much rather than stay home. It’s way less crowded! But what I do love, is to have plenty of appetizers and snacks to help celebrate the occasion. The night wouldn’t be the same without them! This year for the sweet side, I made this Hot Cocoa Muddy Mix. 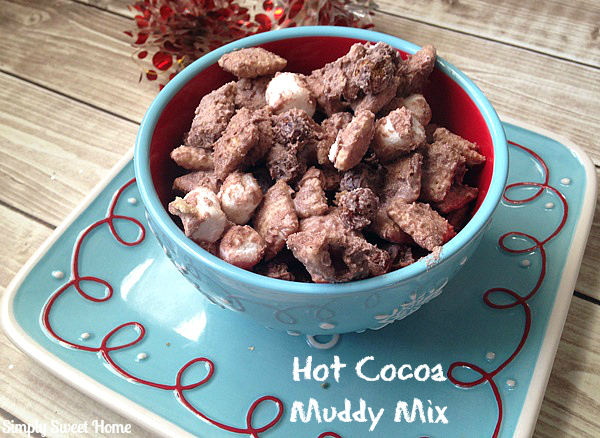 I’ve made a few different Muddy Mix recipes (or Puppy Chow if you will): Peppermint Muddies, Cheesecake Muddy Mix. and Strawberry Cheesecake Muddy Mix. I love this stuff because I can make it in about 10 minutes or less! 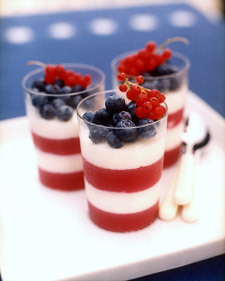 It is also a very festive snack that you can change up with just an ingredient or two (like my linked examples above). 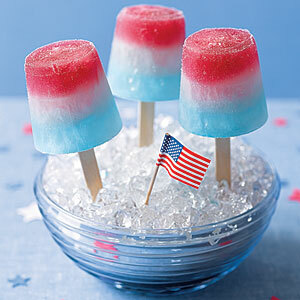 With 4th of July just around the corner, you’re probably thinking fireworks and barbecues! 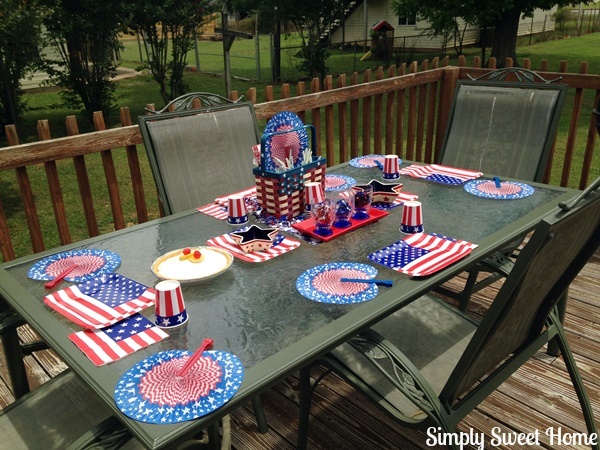 Today I’m sharing some products and ideas to help you decorate for party and give your backyard barbecue a real patriotic feel. I received a great assortment of products from Oriental Trading. Although you may think of the company as the place to buy favors, banners, games, and paper plates for your party, as you browse their selections, you will actually find a great assortment of high quality home decor such as wreaths, table center pieces, and even wall signs and glass platters. I just love this stuff! I’m especially impressed with the high quality of the items I received, as well as the colors and overall look. Everything is such a great value, and there are a number of things to fit various personal styles and needs. 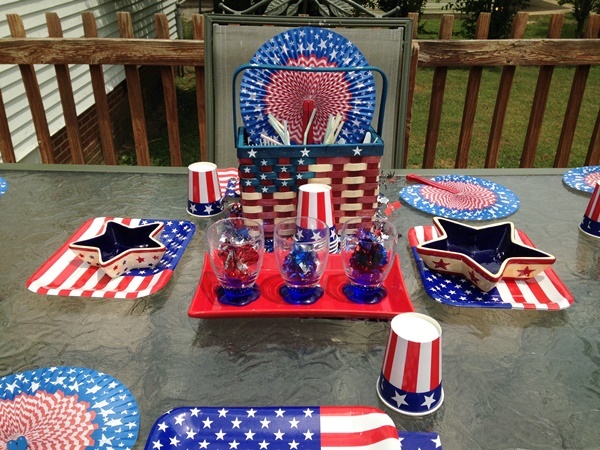 Even if you are not having a party and just want a few patriotic pieces to put out in your house to decorate for the summer months, Oriental Trading has some great finds. Take a closer look at some of the items I received, and you will see just how easy it is to turn your back yard into a festive place for the upcoming holiday. Table Decor Made Easy! You don’t have to spend a lot of money to create a festive table. If you set your table ahead of time with your plates, napkins, and cups, then your table will look festive already without adding anything else. 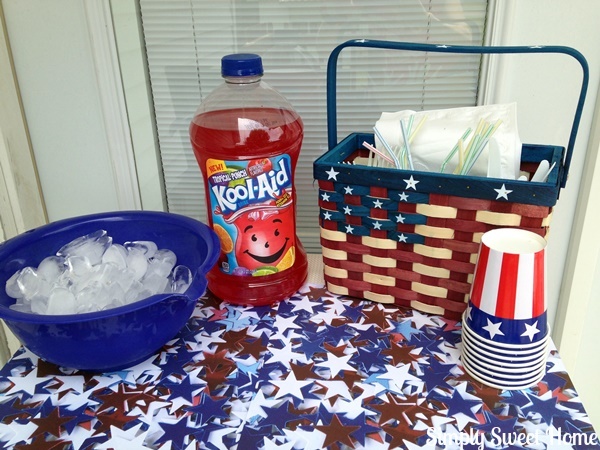 Oriental Trading has a great party pack that includes invites, plates, napkins, and cups for 4th of July, and they look great! As for additional decor, a great centerpiece can go a long way. This utensil basket made a very festive centerpiece. And I’ve surrounded it here with out patriotic looking dishes. These are of a super great quality! For the perfect pre-party decor, you can place your dishes on the table ahead of time. Then just before the party, place the food in your bowls and trays for the ultimate party table! Easy Drink Bar! If you don’t have a bar, you can still have a festive drink area. Just use a small table or cart. A festive table-cloth, fabric piece, or banner, will really dress up your table. Then just add you a bowl of ice, drinks, cups, other essentials, and perhaps one or two pieces of table decor. Home Decor Made Easy! To make your home a little more patriotic, Oriental Trading has some really cute items. As you can see, the basket makes another appearance here. 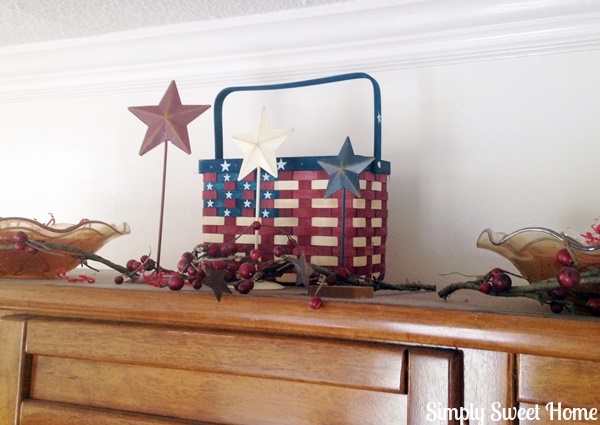 I’ve placed this on top of a cabinet in my kitchen, along with these super cute metal stars, and some star/berry garland that I already had on hand. Again, here you only need a few items to add a little color to a shelf or cabinet area. And I, of course, LOVE wreaths! This wreath is a smaller size than a lot of others that I have, but I looks great, and I love the festive color, as well as the texture of it. Last but not least, you can adorn your front porch and garden area with a cute sign such as the one above. The metal stick is included, and the flag is super cute! 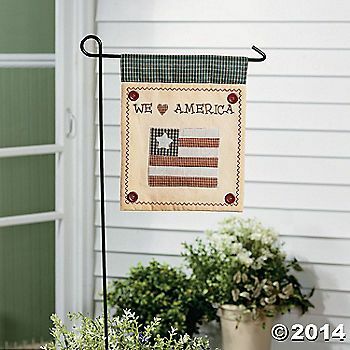 And to add more color to your porch, Oriental Trading has a great selection of banners and window decor. 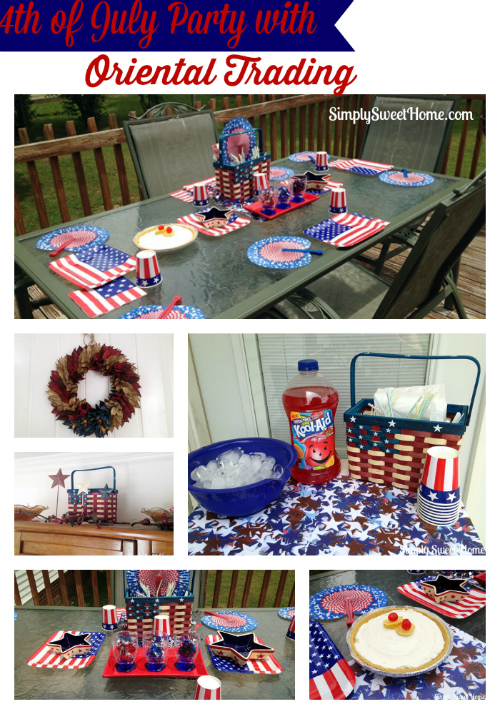 Do you decorate in the summer? Please leave me a comment telling us your favorite summer decor trend! Welcome to this week’s Friday Favorites! 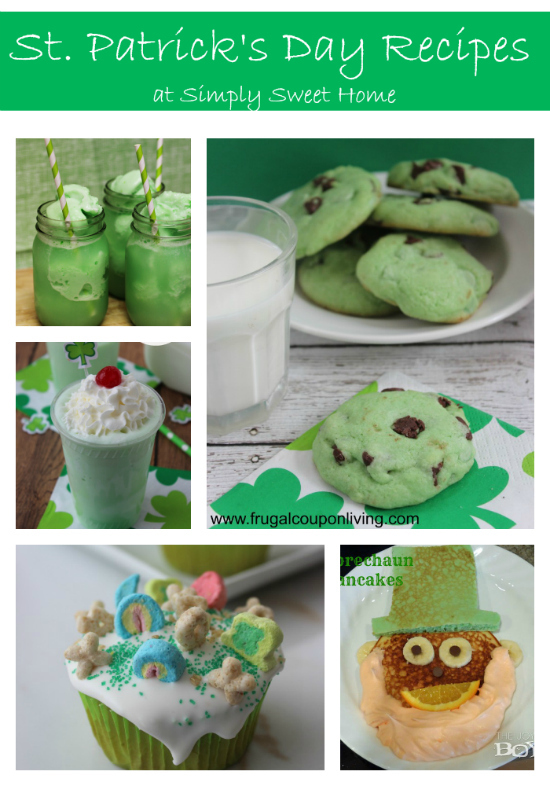 This week we’re celebrating St. Patty’s Day a little early with a few St. Patrick’s Day inspired posts. Hope they inspire you to create something green and lucky! I’m so excited to share this week’s recipe with you! 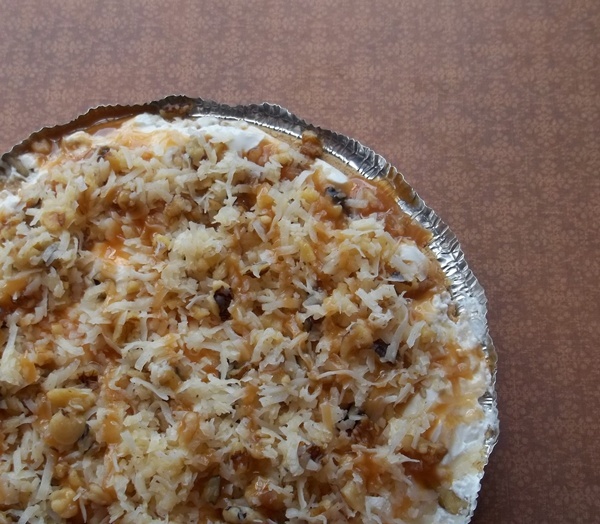 I saw this Caramel Drizzle Freezer Pie on Pinterest a few weeks ago, and I could hardly wait to make it! 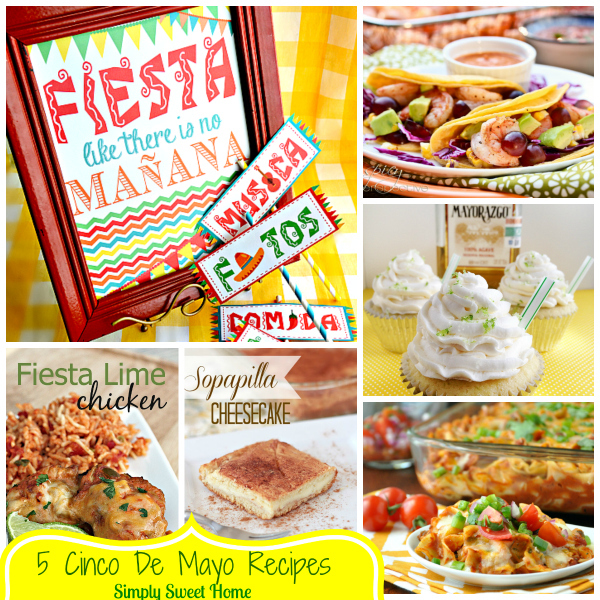 The recipe comes from All Recipes, a great source for any cook or baker, and I just know you’re going to love it! This is the perfect pie for summer time because it’s very sweet and it’s also served cold. But I, for one, think it is the perfect pie for any time of year. I’m actually looking quite forward to making it for the Thanksgiving and Christmas season. And as if the taste of this pie wasn’t a good enough reason to make it, it’s also super easy to make, and the recipe yields 2 pies, so it’s perfect for parties and pot lucks. I was looking ahead to my May schedule today, and I got really excited when I learned about a new and FREE event for bloggers, which I will be participating in! This is a Father’s Day Giveway. The prize is a gas grill or pay pal cash! Please check out the details below. The holiday entertainment season is upon us, which means lots of excuses for drinking and desserts. 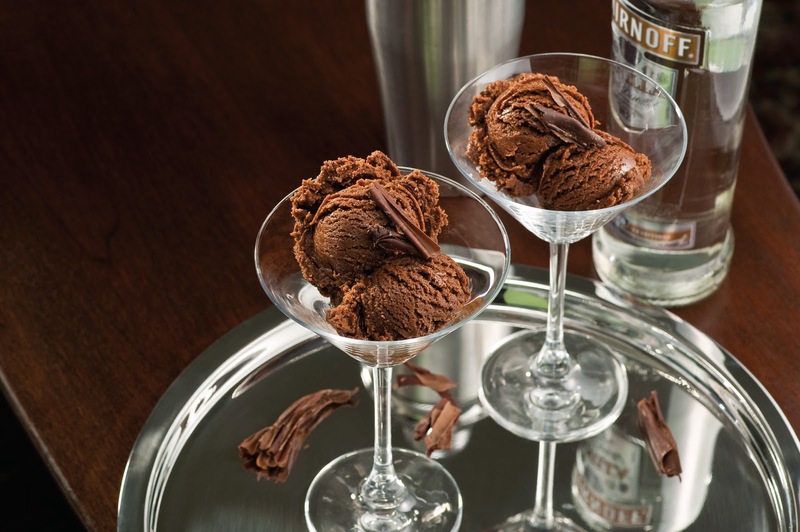 What better way to impress your guests at the end of a dinner party or holiday festivity than with boozy ice cream. I had the opportunity to review this book, and I think it will make an excellent addition to your library of cookbooks! It has a variety of Ice Creams, Sherbets, Sundaes, Floats, and more to add flavor and fun to your holiday parties. You’ll find everything from the ever popular Pina Colada to Margarita Ice Cream, as well as Irish Coffee, Mint Chip with Creme de Menthe, Mudslide Sundaes, and even Bar Brawl Ice Cream Sandwiches! 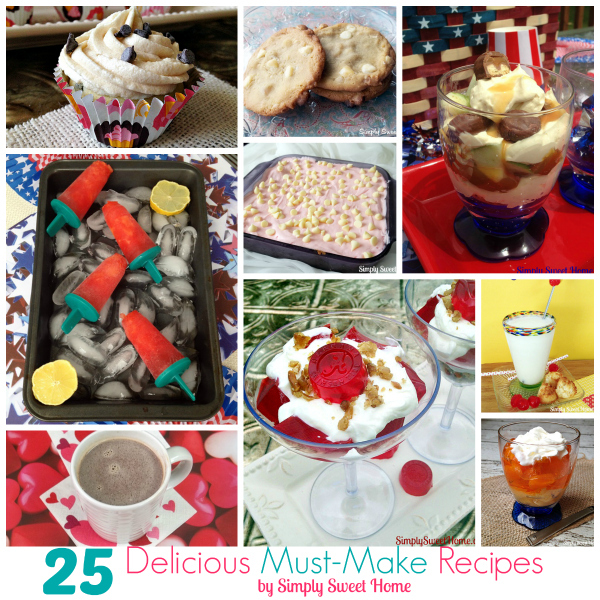 And if the names of the recipes don’t tempt you, the photos will! 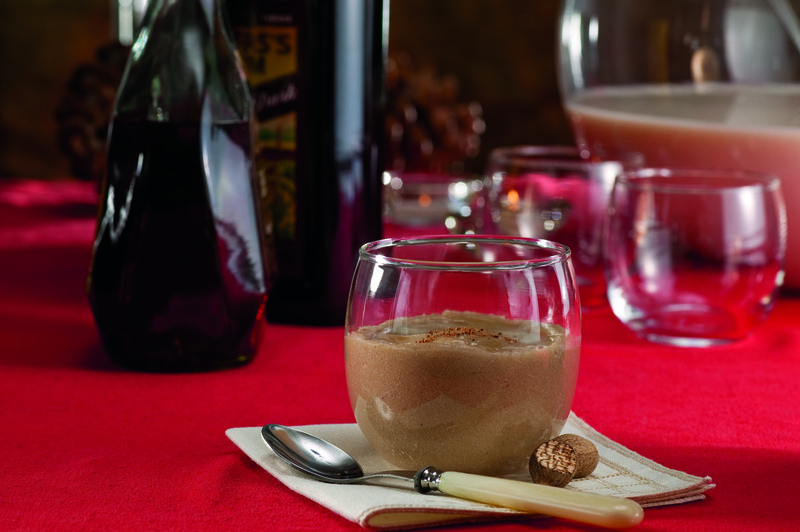 Just take a look at this Chocolate Martini, and you’ll see what I mean! Today along with a giveaway of this book, I’m pleased to bring you an exclusive recipe from the book! The Recipe is for Butter Pecan with Brandy! Whenever I think of fall and the Thanksgiving holiday, I always think of Pecan Pie and other Pecan Recipes, so this ice cream seemed like the perfect one to share this week! This recipe calls for candied pecans; however, toasted pecan halves can be substituted if you don’t have the time. We recommend going the extra mile though. 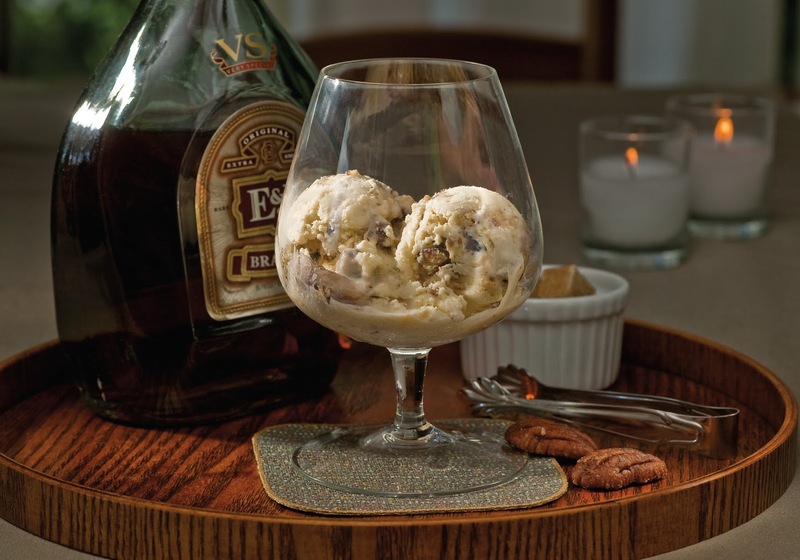 It gives the pecans a great texture along with the flavor. 1. Mix the milk and heavy cream in a medium saucepan over medium-low heat. While the milk mixture is heating, split the vanilla bean down the center lengthwise and scrape out the seeds. Whisk the seeds into the milk mixture, then add the empty pod to the pan. 2. Steep the milk mixture and vanilla. Once the milk mixture is scalding, remove the pan from the heat and cover it. After about 15 minutes, remove the vanilla bean pod. 3. Reheat the milk mixture back up to scalding. 4. While the milk mixture heats to scalding, whisk together the egg yolks with the brown sugar and cornstarch in a medium bowl until slightly fluffy. Gently stream about one-third of the hot milk mixture into the eggs while whisking continuously. This is called tempering. It’s important to whisk while streaming the hot milk. If you just pour in the hot milk and then whisk, you may get scrambled eggs. 5. Thicken the custard over low heat. The custard should thicken rather quickly because of the cornstarch. Pour the egg and milk mixture into the rest of the milk mixture in the sauce pan and stir continuously on low heat with a heatproof spatula. Make sure you scrape the bottom evenly while you continuously stir. The custard is thick enough when you can draw a line on the back of the spoon with your finger and the line retains its shape. 7. Dissolve the gelatin in the cold water. Pour the water into a small saucepan or microwave-safe container and evenly sprinkle the gelatin on top. Allow to sit until the gelatin appears to have absorbed as much water as it can, about 2 minutes. This is called blooming. Gently warm over low heat and stir until the gelatin is completely dissolved into the liquid, about 3 minutes. 8. Spike the custard with the cold brandy and gelatin mixture. Refrigerate the alcohol until completely cold. Do not speed up the process by putting it in the freezer, which may make the gelatin set up too much before it is added to the custard. Pour the gelatin into a medium bowl and whisk in the cold alcohol until combined. Do not attempt to skip this step by pouring the alcohol directly into the saucepan or microwave-safe container with the gelatin. There might be enough residual heat to heat up the custard and prevent it from thickening in the ice cream maker. Pour the cold custard into a large bowl. Stream the alcohol and gelatin mixture through a fine-mesh strainer into the custard and whisk until thoroughly blended. 9. Churn the ice cream for at least 20 minutes. Pour the cold custard immediately into the ice cream maker and churn for at least 20 minutes, or as directed. Due to the alcohol content, you may wish to churn it longer to get the desired thickness. If you don’t want to serve the ice cream immediately or you want a firmer texture, transfer it to a freezer proof container and freeze for several hours before serving. 10. Add the candied pecans. Scoop about one-third of the ice cream into a freezer-proof container and sprinkle about one-third of the candied pecans on top. Repeat the layers twice more with the remaining ice cream and pecans, then gently fold it all together. Be sure to work quickly—if the ice cream melts too much, it will just get icy once it’s in the freezer. Buy It! 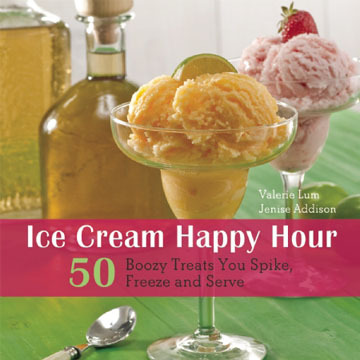 Check out Ulysses Press to find out how to order your copy of Ice Cream Happy Hour. Win it! One Simply Sweet Home reader will win a copy of Ice Cream Happy Hour. How to Enter: Please use the Rafflecopter form below. Giveaway will be open through Nov 19. 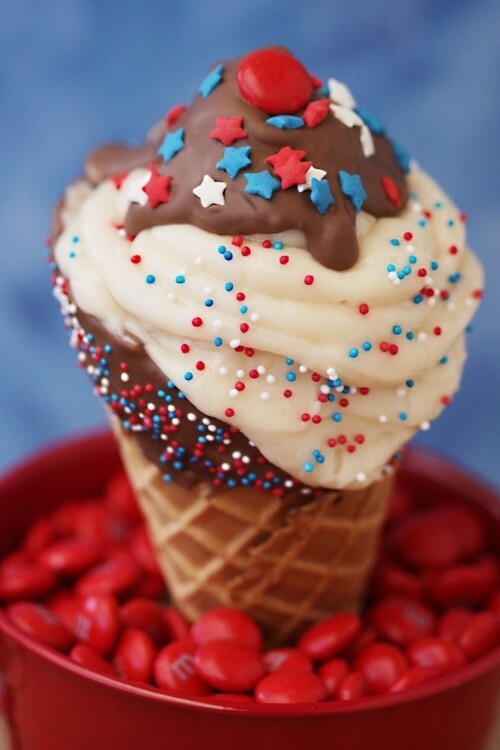 I always enjoy checking out new food ideas for 4th of July. They are so festive, fun, and patriotic! 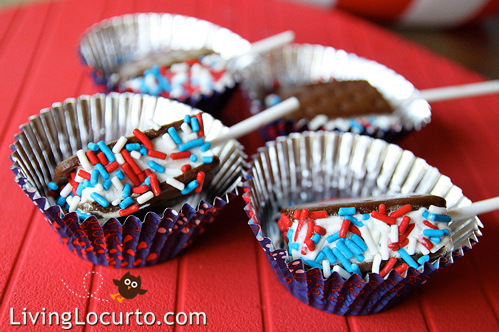 A few weeks ago I shared some Patriotic Desserts in honor of Memorial Day. 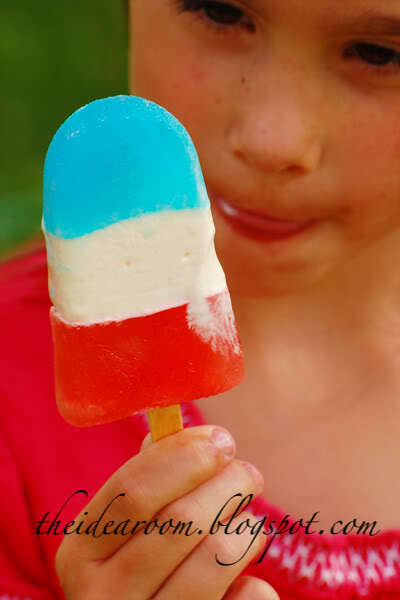 And this week I’ve gathered together some fun and cool treats that you can prepare for 4th of July. Hope you enjoy! My mom gave me this wreath. Isn’t it cute? 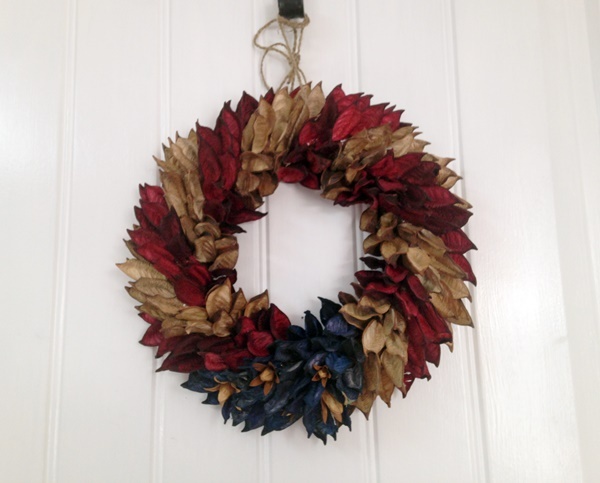 I have this on my door right now for 4th of July, but I really love decor like this year round because I adore the country style! To make this wreath, you start with a vine wreath. Next a string of garland featuring small metal stars was added. Also strung on this garland are some small bells, which are painted red or blue. I’ve seen similar garlands sold at decor retailers (perhaps Pottery Barn or Current), so I’m sure you could find something similar with a simple internet search. Or you could go the less expensive route and buy some wire/foil type garland from Wal-mart or the dollar store. Next wooden hearts and stars were painted and added to the wreath using hot glue. The ribbon at the bottom can be tied and then added also using hot glue, or you can loop the ribbon through the vine and then tie it in lieu of glue. Finally the star and welcome sign are suspended down the middle using a simple wire wrapping technique. And another wire is wrapped around the top for easy hanging. I’m linking up at these parties.